In case you’re wondering, Bake Along is an event hosted by Joyce from Kitchen Flavours, Lena from Frozen Wings and Zoe from Bake for Happy Kids. They will decide on a theme (can be a general theme like éclairs or a specific recipe from a cookbook) and we’ll bake them and blog about it on the stipulated date. It’s a great avenue to try out recipes that you’ve always wanted to try, but didn’t have the motivation to do so! Filled with vanilla pastry cream – classics never go wrong! After my experience in baking cream puffs, baking éclairs is pretty straight forward to me now. I used the same recipe for my choux and pipe strips instead of mounds. As for the filling, I filled half of the éclairs with vanilla pastry cream and the rest with chocolate pastry cream. My friends are chocoholics, so they actually preferred the chocolate ones to the vanilla, while I personally like them both the same. Filled with chocolate pastry cream – for the chocoholics out there! A side note from the éclairs – I received an award some time ago in October, but finally got around blogging about it now – I know, I know, I’m such a huge procrastinator… But it’s never too late, right? 😉 And I think I might have missed out some of the awards that are being passed on to me, so do let me know, okay? Would love to give some credit to you guys! And so, a huge thank you to Suzanne from A Pug In the Kitchen for nominating me this award! Suzanne is a lovely and sweet foodie who is currently blogging a lot of Christmas treats (I’m so in love with the Chocolate Rugelach and the Triple Threat Chocolate Squares!) She also has two really adorable dogs (wish I hope to see more photos of them on your blog, Suzanne!) Do hop over her blog to see what she whips up in her lovely kitchen! As part of the rules, I’m supposed to name 15 blogs that inspired me in my blogging journey, and here they are! Okay, this is more than 15, but all these blogs are definitely worth visiting (there are so many other blogs I want to list!) Do hope over to their blog and say hi! For those nominated, it’s not compulsory to pass it on, I just want to let you guys know that I’m a huge supporter of your blogs and am always inspired by you guys! Combine milk, butter, sugar and salt in a pot. The butter is softened and chopped to little pieces so that it melts fast during heating. Heat the mixture over high heat, stirring occasionally with a wooden spoon, and bring it to a rolling boil – the mixture should be boiling and bubbling vigorously until the layer of butter is no longer floating on top. Using an electric mixer, mix the dough on low speed for 5 seconds, then add in the beaten eggs, a little at a time (I estimated one tablespoon each time). Make sure the dough has fully absorbed the eggs before adding more. The dough will first seemed to separate but will come together eventually into a thick, smooth and piping consistency – and that’s choux pastry! Transfer the choux into a piping bag fitted with a plain tip (about ½-inch). Pipe the choux onto the baking sheet in 3-inch strips, spacing them 2 inches apart. You'll end up with about 20 choux. If you get little tips after piping, dampen your finger in a little water and flatten the tip of the choux to prevent it from getting burnt during baking. Spray the surface of the choux with a little water immediately before baking – this helps the éclairs to expand even bigger during baking. Bake the éclairs for 20 minutes at 200 degrees Celsius. Reduce the heat to 175 degrees Celsius and bake for another 20 – 25 minutes until the éclairs are golden brown and well-risen. During baking, no matter how excited you are, do not open the oven to check them as it will cause them to deflate and it’ll be the worse thing to happen ever. Once the éclairs have cooled completely, pipe some pastry cream into the éclairs. 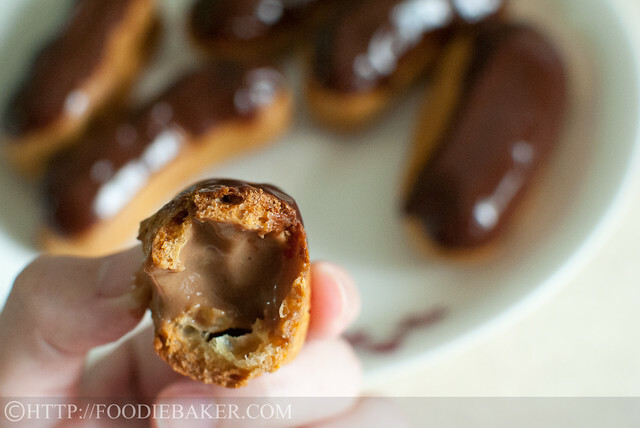 Dip the top of the éclairs into the chocolate ganache and serve. The éclairs can be stored in an air-tight container in the fridge for up to 2 days. Make ahead (unfilled éclairs): Place the unfilled éclairs in a single layer on a baking sheet. Freeze for 1 hour. Transfer the frozen éclairs into a freeze-proof bag and keep them frozen for up to 2 months. When ready to use, remove the éclairs from the freezer (no need to defrost) and pop into a preheat oven of 160 degrees Celsius for 5 to 10 minutes. Let cool and use as needed. Make ahead (filled éclairs): Place the filled and ganache-d éclairs in a single layer on a baking sheet. Freeze for 1 hour. Transfer the frozen éclairs into a freeze-proof bag and keep them frozen for up to 1 month. When ready to serve, remove the éclairs from the freezer the night before and let it defrost in the refrigerator overnight. If urgent, let the éclairs defrost at room temperature for 20 minutes. (If you fill the éclairs with ice cream, just serve them straight from the freezer.) The éclairs will be softer as compared to freshly baked ones. After ¼ of the hot milk has been added, add the hot milk in a slow and steady stream, whisking constantly – until ¼ of hot milk is left. This whole process is called tempering. Once the egg yolks have been tempered, pour the egg yolk mixture back into the pot and whisk to mix them altogether. Place the pot back on medium heat and with a wooden spoon, stir the mixture constantly until the mixture has thickened and has started to boil – you’ll see huge air bubbles popping out of the custard – that’s a sign that the pastry cream is ready. Remove the pot from heat and place it in the bowl of ice water. Stir the pastry cream constantly until it has cooled down. Stir in the vanilla paste / extract and melted chocolate if using. Heat the heavy cream in a saucepan until it starts to simmer (small bubbles began to appear on the side of the saucepan). Pour the cream over the chocolate chips and let stand for 1 minute. Whisk until all the chocolate has melted. Let the ganache cool slightly (it will thicken as it cools) before using. If the ganache is too stiff, place it in a warm water bath and stir gently till it is smooth. You can substitute milk with water, but milk aids in the browning of the éclairs – makes the éclairs darker and more golden brown in colour. The first bake at 200 degrees Celsius is to help the éclairs rise rapidly to form an outer shell with a hollow interior. Once the outer shell has dried, it will rise no more, hence if you want even bigger éclairs, spray the surface with a little water to give the éclairs more rise. The second bake at 175 degrees Celsius is to allow the exterior to turn crisp and the interior to dry out. Thank you Raymund! Have an amazing Christmas and take care! Wow thats an amazing eclairs, that chocolate is calling me. 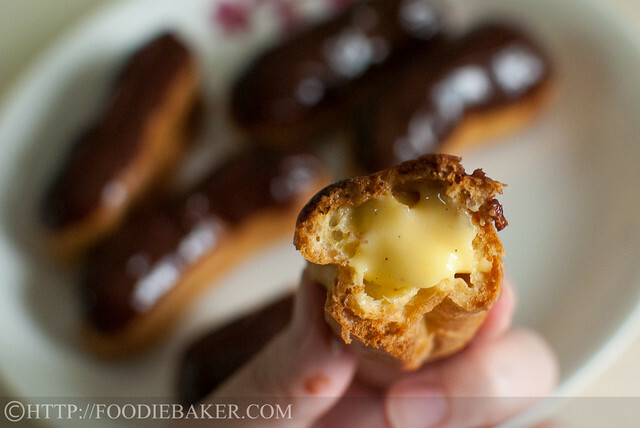 Oh yum, eclairs are easily one of my all-time favorite pastries! The vanilla bean flecks throughout the cream filling looks especially delcious. Hi Kit! Thank you so much. Do make them one day, but be careful, they’re very addictive! 😉 You’re most welcome about the award, I enjoyed reading your blog 🙂 Have a great week ahead and take care! Thank you for the compliments! I will choose pastry cream over whipping cream anytime, it’s so much more delicious! Thank you for your compliment! And you’re most welcome about the award, you deserve it! Take care! Thank you Jeannie! I love them both 😉 Have a great week ahead! Lovely little bites. I prefer the pastry cream filling to the whipping cream but chocolate fillings do little for me. The chocolate glaze on top is beautiful. These are perfect looking eclairs, and thanks for sharing the award with me. I’m honored! Hi Angeline! Thank you for the compliments. Don’t be disheartened, I’m sure you will be able to bake pretty Choux the next time 🙂 have fun baking! Take care! Hi Lena! I’m glad you like the Choux recipe! Yes, hosting the blog on another platform allows me to do put the linky, so I’m glad I made the shift. You are most welcome about the award Lena, it has been really fun baking along with you, Joyce and Zoe! To many more bake alongs to come! Take care! A plate of vanilla-pasty-cream-filled eclairs coming your way John! 😉 you are most welcome! Hope you are having a great week and take care! You are most welcome Bobbi! Have a great week ahead and take care! Hi Bobbi! The trick I used is to feed my friends more of these baked goods than to myself… 😉 haha you got me cracking up at the treadmill part, I think I need to live on one too! Hi Zoe! Sorry for the absence, was overseas for a work trip and the last bake didn’t go very well so I didn’t manage to blog about them! I hope to continue bake along with you 3 ladies as usual 🙂 it was a great and fun year and I’m sure there’s more to come! Hi Joyce! I know right, I have to force myself to stop, otherwise I’ll just finish them all at one go! Thanks for hosting Bake Along all these while, I had lots of fun and I’m sure there’ll be many more to come! Thanks for the award, Jasline! 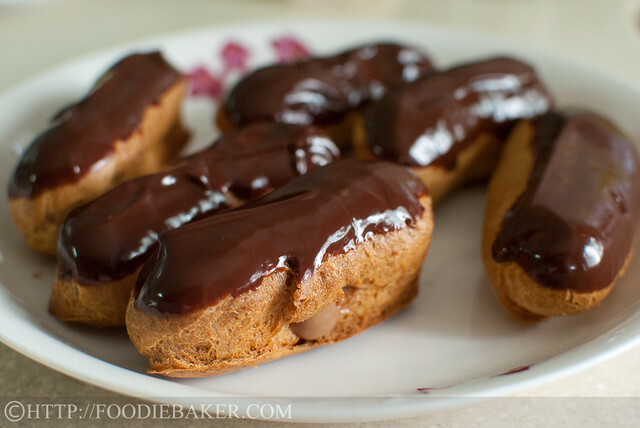 Your eclairs look absolutely divine, I could eat a few of these at a go. Hi Jasline, it has been a while i didn’t blog hop over your side here. yOur choux pastry and Lena’s one was so amazing pretty. I hope and wish to bake like yours. I fail my first attempt and will try to bake for the second round. hi jasline, i believe the ones with choc pastry cream is really a luscious treat for your friends. yeah, i used your recipe and thanks so much, i got no problem making the choux pastry and i like it. thanks so much! i’m also glad to see that we are now able to see the linky on the same page as your post! thanks so much again for baking with us and oh, and the award too. I really appreciate that, from the bottom of my heart! Good golly! These éclairs look so very good. As big a chocoholic that I am, when it comes to éclairs, I’m a bit of a traditionalist. I’ll take mine with vanilla pastry cream, please. And congrats on the award, you are most sweet to pass it on! Congratulation with your award and I really appreciate you giving me this great recognition. Hi Jasline, I love both your fillings! The vanilla pastry cream sounds good, these are “dangerous” to make, as they would be gone in minutes! Thank you for baking along with us, Jasline, and for the support in 2012, time has certainly passed by in a flash! We look forward to another year of delicious baking! Thank you for the award! I really appreciate it! You are an inspiration with your wonderful baking and endless tips and advises that you constantly shared! Thank you! Have a great delicious week!